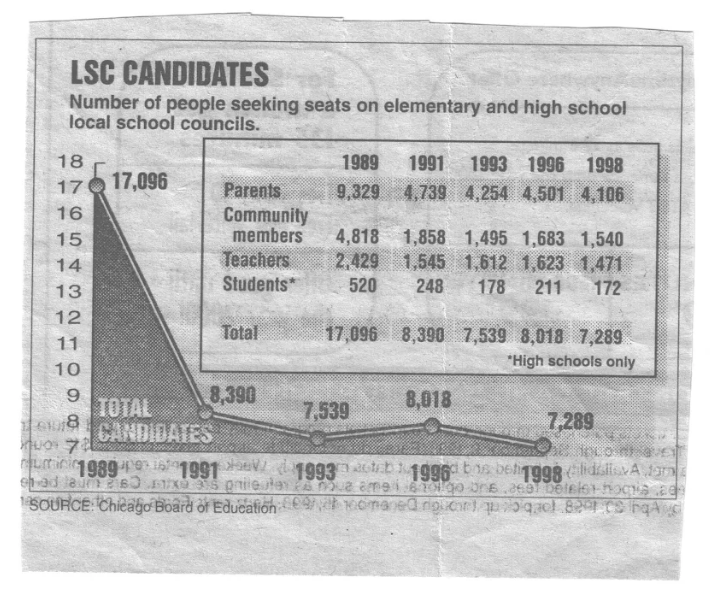 You may ask: given the striking success of the first Sun-Times LSC Election supplement, why haven't similar supplements appeared since 1989? Short answer: it's been the absence of Chicagoans from the leadership of both the Chicago Sun-Times and the Chicago Public Schools from 1989 to the present day. The Sun-Times supplement has an interesting backstory. There would have been no supplement without the publication weeks earlier by the Chicago Tribune of a 40-page special supplement for the 1989 Kemper Western Open golf tournament. At that time, both Chicago newspapers had been relegating coverage of the upcoming LSC elections to the back pages of their papers. Frustrated by this neglect of a historic citywide event, two school reform volunteers - Gordon Berry and Steve Sewall - secured 30 minutes with Sun-Times Publisher Charles Price present him with the idea for the supplement. In Price's office, they showed him a copy of the Tribune's golf supplement and stressed the benefits both to Chicago's schools and to the Sun-Times itself of the LSC Election supplement. On the spot Price offered not only to produce the supplement but to underwrite its $10,000 printing and distribution cost. 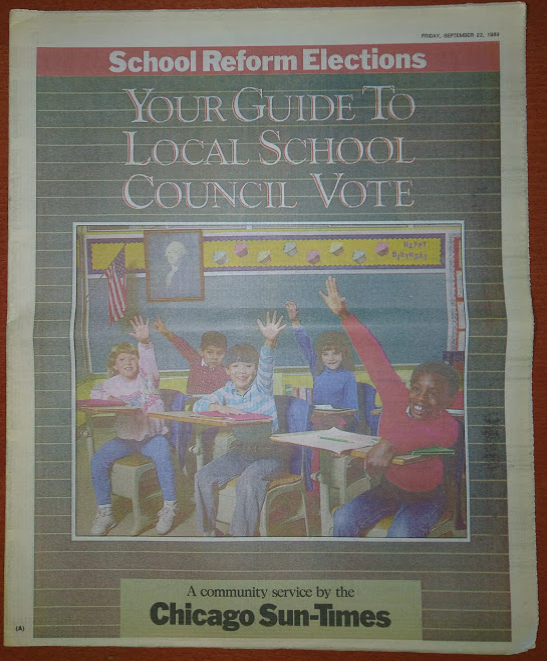 Attractively designed and produced by Sun-Times education editor Linda Lenz with extensive input from from school reform groups, the Supplement featured lists of training organizations for LSC members, Nomination Forms for people interested in running for their local LSC, names of contact people and addresses of all schools where elections would be held. 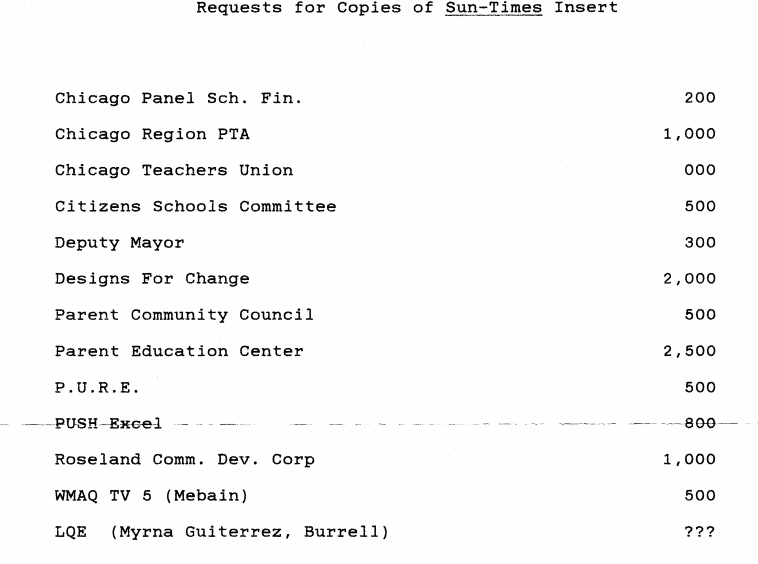 1993 Letter of Introduction to Sun-Times President Dennis Britton by Citizens Schools Committee President Gordon Berry.